With online sales expected to make up 80 per cent of pizza restaurant group Domino’s business in the next two to three years, the Company has launched a Quick Ordering feature allowing customers to save their preferred pizza orders and payment method and reducing the number of clicks to only four. Domino’s Group Chief Digital Officer, Michael Gillespie said the launch of Quick Ordering on the Domino’s website and App provided customers the option of saving their order for next time. “A lot of our customers are passionate pizza lovers, meaning they know what they like and they like what they know,” Mr Gillespie said. “This new addition to our digital platforms means they can now save their orders for next time and reduce the number of clicks and time taken to place an order,” he said. “We know a huge percentage of customers want to access our brand through technology so we need to make sure we fit into their lives – anywhere, anytime,” Mr Gillespie said. “Quick Ordering helps us make it easier for our customers to do this,” he said. Mr Gillespie said pizza lovers still have the opportunity to customise and tailor their orders if they change their mind or want to try something new or add vouchers. “We would never remove this function because choice is also extremely important to our customer. It’s simply about adding even more convenience for our customers,” Mr Gillespie said. Another extension to Quick Ordering is the implementation of payment ‘tokenisation’ – meaning customers can also now save their preferred payment option to their order. “With remember my payment details and remember my previous order, Domino’s is committed to leveraging the latest technology and best practices which enables the pizza experts to pass on time saving initiatives to hungry customers,” Mr Gillespie said. Mr Gillespie said this feature could help customers reduce their order time by up to three to four minutes. “By saving their preferred payment option customers reduce the number of clicks again to four- it really couldn’t be any easier,” Mr Gillespie said. Mr Gillespie said these changes will help drive the Domino’s digital growth over the coming years. “Our determination to be the market leader for digital innovation has already seen us achieve almost 60 per cent of sales online and, over the next three years, we want to grow this to 80 per cent,” Mr Gillespie said. Domino’s Pizza Enterprises runs and operates a total of 1,421 stores, including 645 in Australia and New Zealand, 422 in Europe and 354 in Japan. 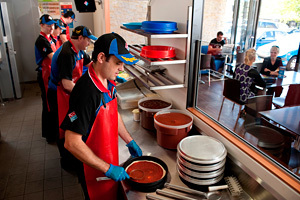 Australian Food News reported in February that Domino’s had recorded its strongest profit for a half-year period, with a Net Profit after Tax for the first half of the 2015 financial year of $29.1 million, up 44.2 per cent on the prior corresponding period. Pepsi Co Australia and New Zealand is now selling Gatorade Liquid Concentrate. Chobani has launched two new yoghurt flavours.